FTSE Stocks, Bonds and Sterling Calm Ahead of UK Election Result Storm? 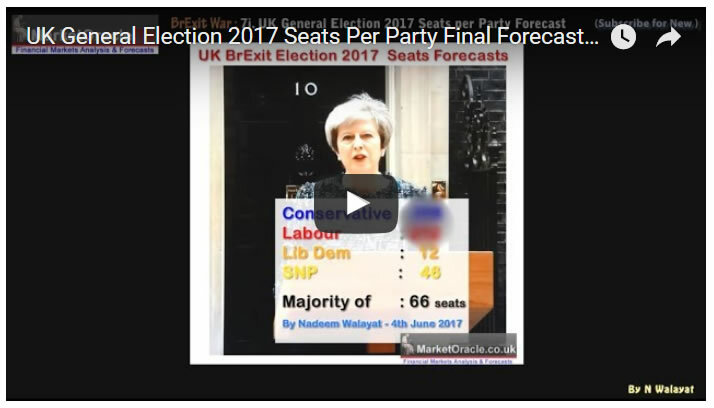 UK stocks, bonds and sterling were calm ahead of the result of the UK general election, where effectively the financial markets are discounting a Conservative election victory on an INCREASED majority in Theresa May's BrExit election, where the higher the number of seats gained by the Tories then the more positive the market response is likely to be. However should the markets also get it wrong this time as they had for the EU Referendum then all hell could once more break lose. But for the time being the markets are calm. 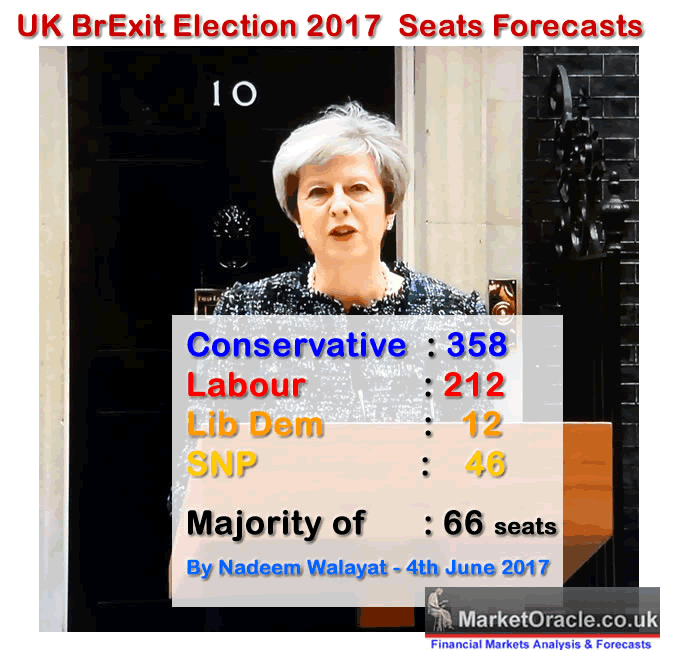 After setting a new all time trading high at the end May, the FTSE has given up some of the gains as we counted down to the polling day in response to YouGov's insane seats forecasts of a hung parliament, though the reaction is much less than the chart implies i.e. only 2% which means the FTSE has basically been flat for the past month. Similarly the sterling short-term chart overly exaggerates the actual movement in sterling during the past couple of weeks, which has basically been in a trading range of between £/$ 1.03 and 1.275, with most recent action to the upside. However should the markets get this election badly wrong then that is likely to immediately wipe at least 10 cents off sterling by probably tumbling to between £/$ 1.14 to 1.16. That would likely be just the initial crash response with further selling to come in subsequent days and weeks to nudge sterling towards parity with the dollar. UK 10 Year bonds similar to sterling is discounting a Conservative increased majority election victory. Whilst the interbank market clearly shows signs of Bank of England intervention, pumping extra liquidity into the UK banking system, hence the fall in the yield. And regardless of the election result we can expect the Bank of England to continue to keep the interbank market liquid. However, unlike for the EU Referendum AND Trump, I don't see a financial storm this time around, but I could be wrong! So this is definitely not the time to take ones eyes off the trading screens and to have game played scenarios of what to immediately do in case of an ALT Election Result which would be to SHORT STERLING! AND SHORT FTSE FUTURES!